Sheer Rain Waterfalls provide a single row of streams of water and project them away from the lip of the waterfall at a 45° angle. The “rain” effect creates a unique waterfall sight and sound. The more water provided to the waterfall, the farther out from the wall the “rain” projects. *All Jandy waterfall styles, except Sheer Arc and Rain Arc, can be lighted using fiber optic lighting. 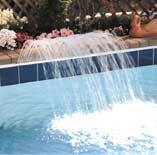 Rain Arc waterfalls can be positioned just above the waterline—no raised bond beam is required—making it perfect for vinyl liner pools. The fall projects up from the unit at a 45° angle and then naturally arcs and descends to the pool surface. Sheer Curtain waterfalls produce a clear curtain of water that descends straight down from the unit. 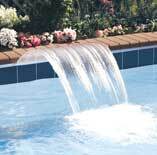 It is ideal for cantilever and swim-out installations. 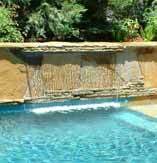 Sheer Arc waterfalls can be positioned just above the waterline — no raised bond beam is required — making it perfect for vinyl liner pools. The fall projects up from the unit at a 45° angle and then naturally arcs and descends to the pool surface. Sheer Descent waterfalls produce a clear arc of water, projecting away from the pool wall. 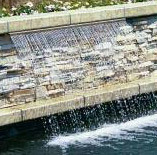 The flow can be adjusted to create a range of effects from an almost silent, glass like sheet of water to a rushing mountain spring waterfall. 1” inch, 6 inch and 13 inch lip from 8 inches to 8 foot wide.